Whitewater Wisconsin Dentist | Dental Perfections | Q: What Is Silver Diamine Fluoride? Q: What Is Silver Diamine Fluoride? Silver diamine fluoride is a highly concentrated fluoridated liquid that is applied to cavities with the intention to stop the cavity from progressing. After two applications the cavity will stop from progressing in 91% of the cases. So I Won’t Need a Filling? Yes and no. 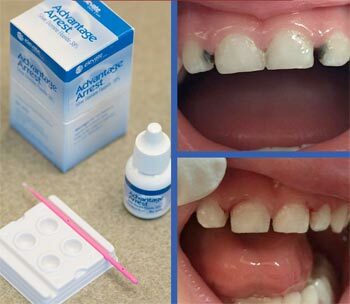 Cavities destroy tooth structure leaving holes in the teeth and silver diamine fluoride will not fill the holes in. How Does Silver Diamine Fluoride Work? We don’t’ know exactly how it works but we know that it works. It makes the exposed cavity surface rock hard and resistant to further tooth destruction. It raises the pH in your mouth, it takes the pain away, it is inexpensive, fast & easy, is painless to apply, doesn’t require anesthetic. Why Don’t We Treat All Cavities This Way? There is a key side effect in that it turns the cavity from a yellow-orange color to a black color. When the tooth is restored with a filing, the black color is not visible. What Are the Indications for Silver Diamine Fluoride? I see two main indications. The first is a young child that has many cavities but is too young to cooperate in the dental chair for extensive treatment. The cooperation level between a 3 year old and a 5 year old is huge. Silver diamine fluoride would just be delay the needed treatment and possibly avoiding general anesthesia which has complications. Cavities only grow larger with time and children have died from untreated cavities. The second indication for silver diamine fluoride use is the elderly where they can no longer care for their teeth and as a result, many cavities have formed. Sometimes the patient or care taker has chosen to not fix the cavities which can result in further tooth destruction, teeth breaking off at the gum line, abscesses that can spread inside your body, and pain. Black holes in the teeth are better than no teeth. Dr. Cheryl Bresnahan is a licensed dentist and the founder of Dental Perfections in Whitewater, WI. If you'd like to ask her a question, please visit the Ask Dr. Cheryl section of our Web site. ©2019 Dental Perfections. All Rights Reserved.